Nick Saban vs. Urban Meyer: A history of the coaching matchup before Alabama plays Ohio State in the Sugar Bowl. College football coaches have almost a month to prepare for bowl games, which can be chaotic. That’s especially true for Alabama’s Nick Saban and Ohio State’s Urban Meyer, who enter their Sugar Bowl clash on New Year’s Day quite familiar with each other’s past. History says a national championship is on the line when Meyer and Saban meet. Both know what it’s like to try to beat the other. 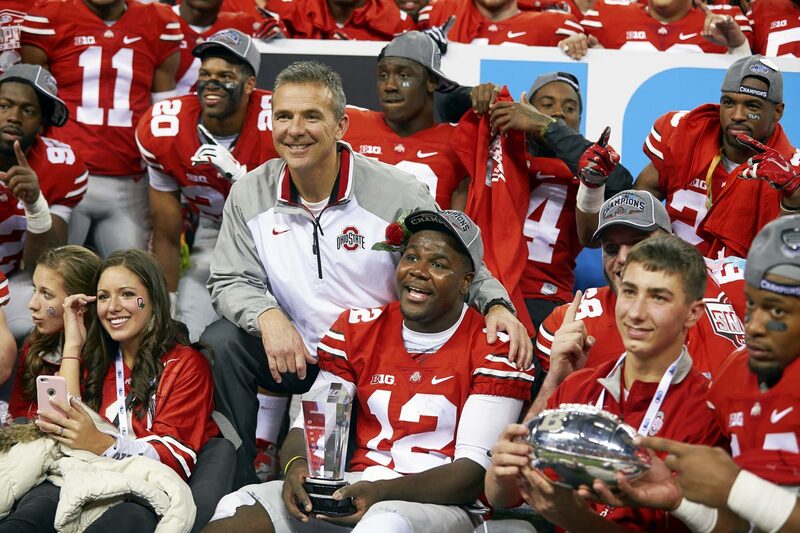 Meyer and Saban combined to win six national championships in the BCS era. Saban has four -- one at LSU in 2003 and three at Alabama -- while Meyer has two with the Gators. The coaches also have a storied history from when both were competing for SEC titles. They’ve faced each other three times in their careers, twice in the SEC title game and once in the regular season. In those matchups, Saban owns a record of 2-1 against Meyer. The winner of two of those games went on to win the BCS crown. As Meyer and Saban get set for their fourth coaching tilt, in the inaugural College Football Playoff, let's look back at the previous three times these coaches met. When Alabama and Florida met in the Georgia Dome for the 2008 SEC title, Meyer, not Saban, was the coach to beat in the conference. The Gators were vying for their second BCS championship in three seasons, while Saban was only in his second year with the Crimson Tide. However, Alabama was unbeaten and ranked No. 1 in the country heading to Atlanta. The Gators, who had lost to an unranked Ole Miss team 31-30 earlier in the year, didn’t flinch. Quarterback Tim Tebow hit David Nelson for a touchdown pass three minutes before halftime to give Florida a 17-10 lead. The Tide responded after the break with a Mark Ingram score and a field goal to regain a 20-17 edge. But it was Tebow, the 2007 Heisman Trophy winner, who came through in the clutch. The quarterback’s five-yard touchdown pass to Riley Cooper gave Florida a 31-20 advantage with 2:50 to play, a lead the Gators wouldn’t relinquish. Florida went on to beat No. 5 Oklahoma 24-14 for Meyer’s second national title. Alabama’s fortunes reversed during the next season’s SEC Championship Game. This time, there was very little drama in the Georgia Dome. The No. 2 Crimson Tide routed the top-ranked Gators 32-13 to mark the second straight upset in the series. Alabama held Tebow in check (63 rushing yards on 10 carries) and kept Florida’s offense scoreless in the second half. Behind Ingram and quarterback Greg McElroy, Saban’s offense converted 11-of-15 third downs and nearly doubled up time of possession, holding the ball for 39:37 of game time. As the clock ticked down, cameras caught Tebow kneeling on the sidelines with tears running down his face. The loss spoiled the senior’s shot at a second straight national title, and third in four years. In the postgame press conference, Meyer was asked if Alabama was the more physical team in this matchup. Alabama carried its momentum into next month’s BCS title game, as it beat No. 2 Texas 37-21. It was the first of Saban’s three national titles in Tuscaloosa. The last time Meyer and Saban faced off was in the 2010 regular season. Alabama and Florida met as cross-divisional opponents on the SEC schedule. The Crimson Tide looked poised for a second straight BCS title run when Florida ventured to Bryant-Denny Saban during the first week of October. Saban’s squad had already beaten two ranked foes (Penn State and Arkansas), while Gators had an unblemished 4-0 record. But Florida wasn’t the same team without Tebow. His successor, John Brantley, threw two costly interceptions, including one in the end zone, to cap a day in which the Gators failed to find paydirt. Alabama whipped Florida 31-6, which at the time stood as the second-most lopsided loss of Meyer's six seasons with Florida. "I was very, very pleased with the way we played in the first half," Saban said after the game. "I thought we played physical, played with toughness, played strong. I was really encouraged." This time, however, neither team went on to win a national championship. Alabama lost at No. 19 South Carolina the very next week and would drop later meetings with LSU and Auburn -- the eventual national champions -- during the regular season. The Tide went on to beat Michigan State 49-7 in the Capital One Bowl. The Alabama loss was part of a more forgettable season for Florida. 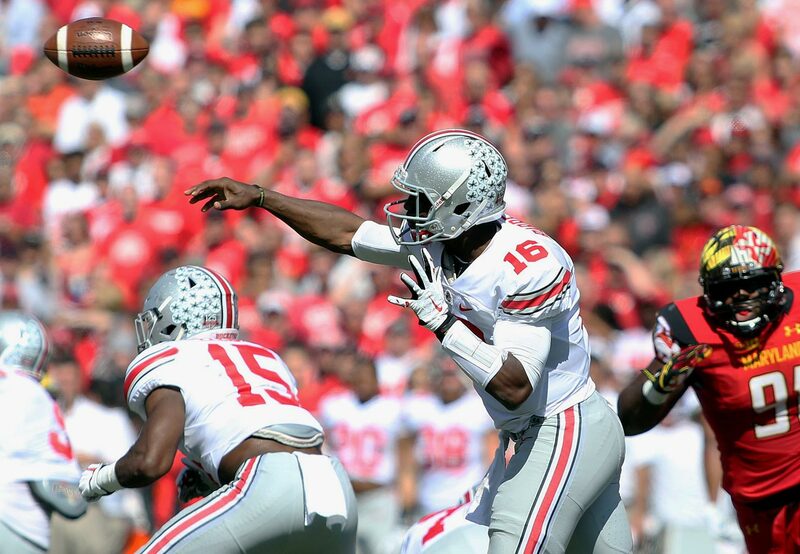 It was the first of three straight defeats that dropped Meyer’s team to 4-3 on the year. The Gators would finish 8-5 with losses to South Carolina and Florida State, as well as a 37-24 win over Penn State in the Outback Bowl. The J.T. Barrett era began with neither a bang nor a whimper, but instead a calm, conservative victory. The redshirt freshman completed 12-of-15 passes for 226 yards with two touchdowns and a blunder of an interception. 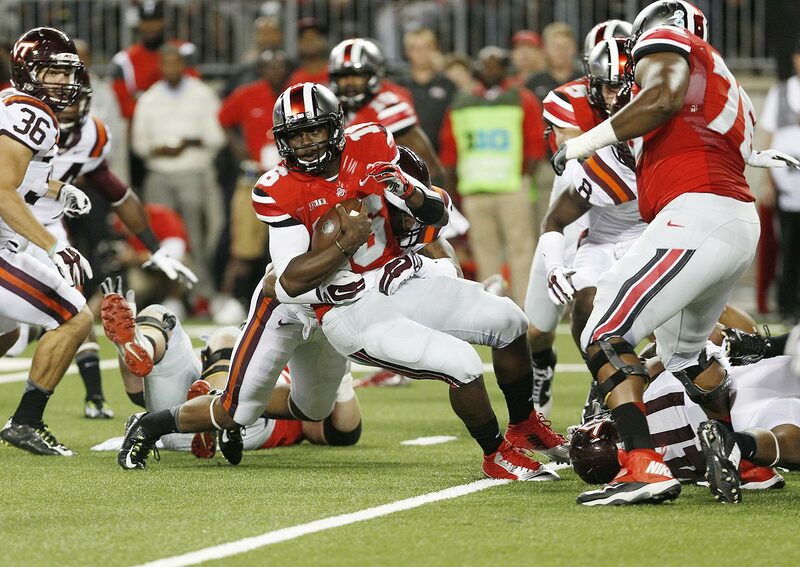 Disaster struck early for the Buckeyes as Virginia Tech -- which went on to barely get to bowl eligibility -- took down Ohio State in Columbus, breaking through a porous Buckeyes offensive line for seven sack while limiting Barrett to 9-of-29 passing with three interceptions. 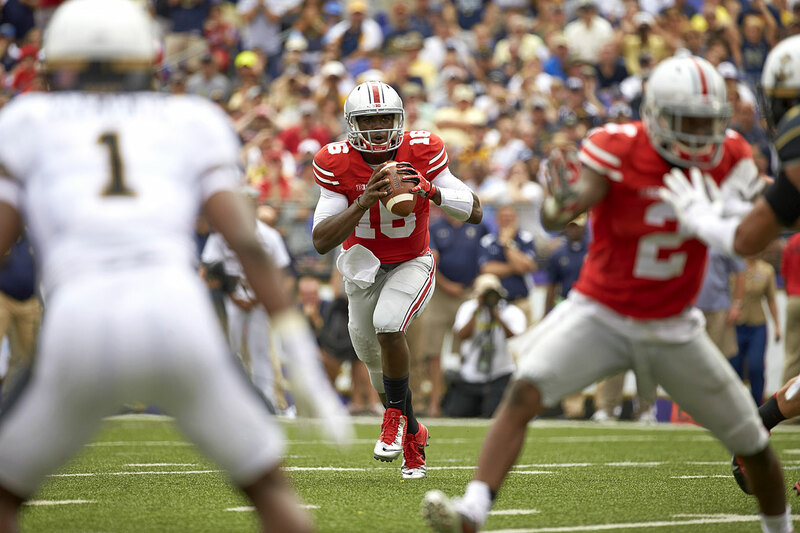 Ohio State took out its frustration from the loss to the Hokies on a hapless Kent State squad, as Barrett tied a school record with six touchdown passes -- five in the first half. Cincinnati quarterback Gunner Kiel kept the Bearcats in it with 352 yards passing and four touchdowns, but the Buckeyes exploded for 710 yards of offense behind Barrett and running back Ezekiel Elliott. The Buckeyes gave Maryland a cold welcome to the Big Ten in the Terrapins' first home conference game. 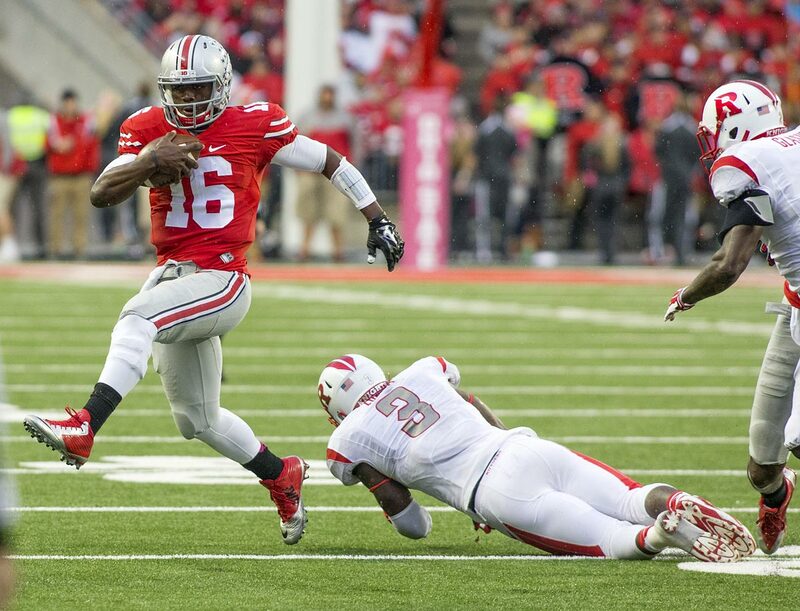 Barrett continued to show his rapid improvement, passing for 267 yards with five total touchdowns, and Ohio State's defense forced four interceptions. The Buckeyes scored 50 or more points for the fourth consecutive game, setting a school record as they trounced the Scarlet Knights. 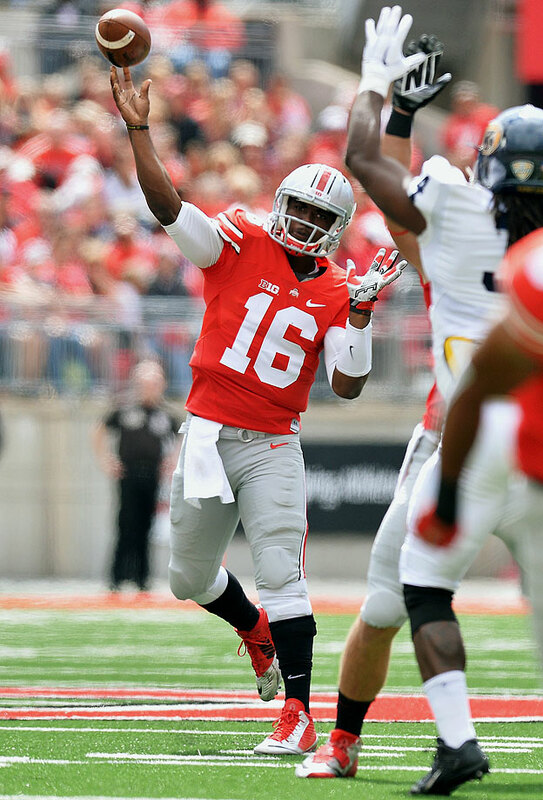 Barrett racked up five total touchdowns with 261 yards passing and 107 yards on the ground. With Barrett struggling through a sprained MCL, the Buckeyes blew a 17-0 lead but escaped Happy Valley with a double-overtime victory. 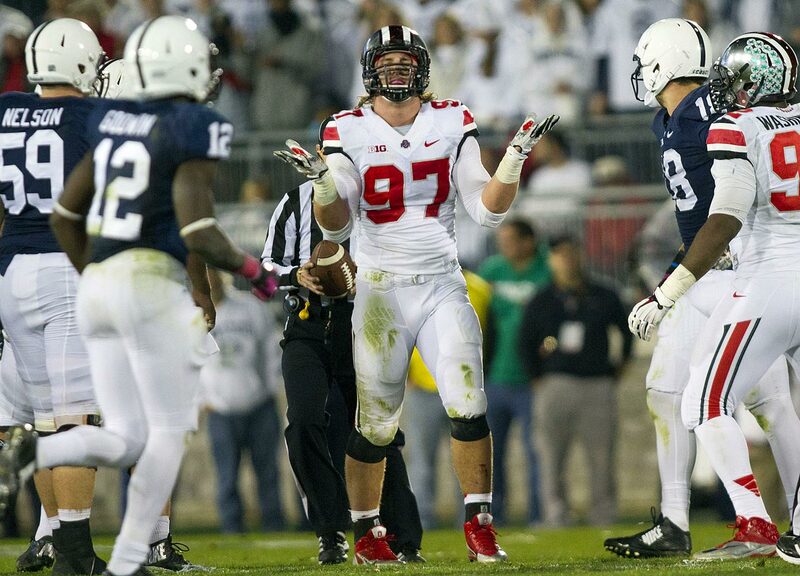 Joey Bosa picked up 2 1/2 sacks, the last one ending the game by forcing a turnover-on-downs. After the scare against the Nittany Lions, the Buckeyes took no chances against the Fighting Illini, building a 48-0 advantage en route to the lopsided win. In a College Football Playoff elimination game, Ohio State proved its superiority with a dominant victory in East Lansing. Barrett passed for 300 yards, rushed 86 and scored five touchdowns while Elliott tallied 154 yards on the ground with two scores. The Buckeyes never trailed in the second half. 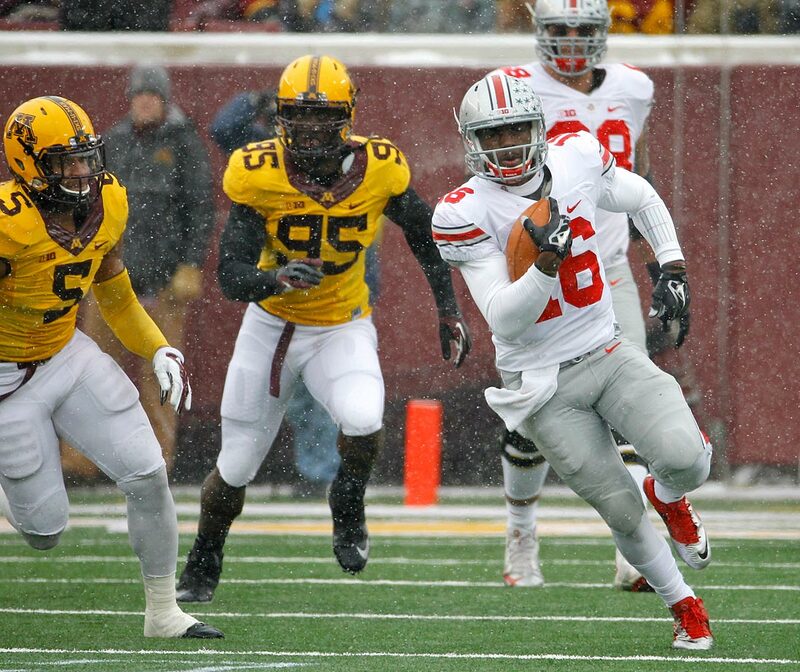 The Buckeyes picked up their second road victory over a ranked team in as many weeks, surviving heavy snow and a 145-yard, three touchdown effort from Golden Gophers running back David Cobb. Despite Barrett setting the Ohio State record for total touchdowns in a season, the Buckeyes needed a late onside kick recovery to seal the win. Tevin Coleman (228 yards rushing and three touchdowns) and the Hoosiers gave the Buckeyes all they could handle and might have pulled the stunning upset if not for Jalin Marshall. 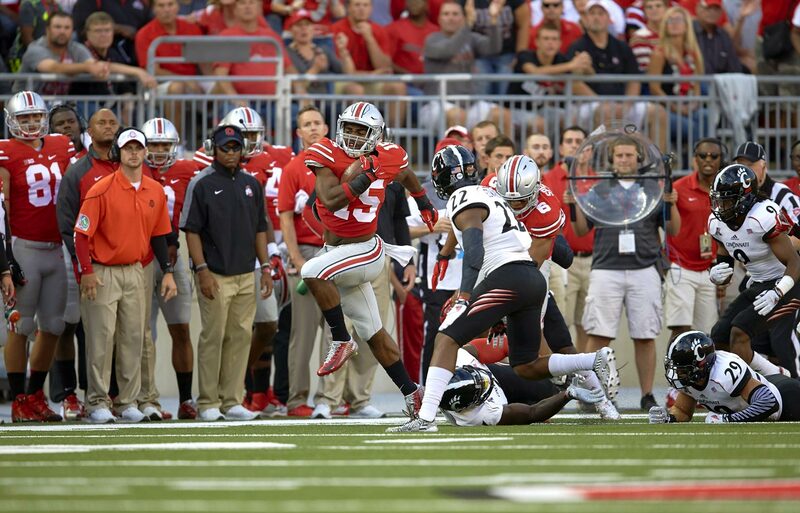 Ohio State's redshirt freshman score four straight second-half touchdowns, including a 54-yard punt return late in the third quarter that gave the Buckeyes the lead for good. 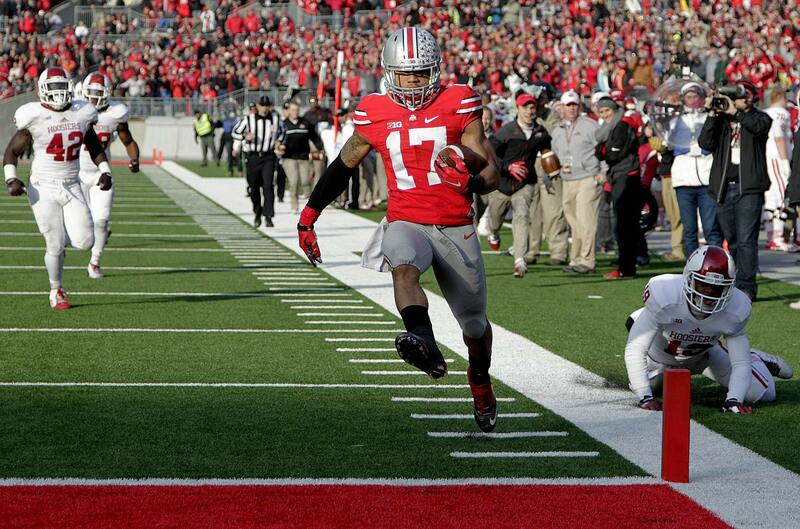 The joy of a closer-than-expected win over their biggest rival was muted by the Buckeyes' sorrow over J.T. 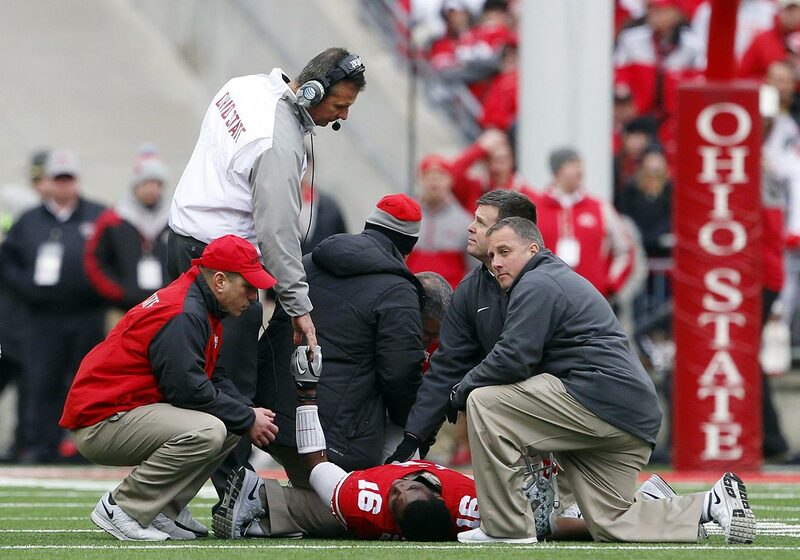 Barrett's injury, a fractured ankle that ended his season. After the quarterback went down on the first play of the fourth quarter, Ohio State scored twice to pull away for the victory. No Braxton Miller and no J.T. Barrett? No problem for the Buckeyes. Third-stringer Cardale Jones engineered an annihilation of the Badgers as Ohio State dominate every facet of the game and leapfrogged TCU while holding off Baylor to earn the No. 4 seed in the playoff. Jones delivered again for the Buckeyes, picking up 286 yards of offense as the Ohio State stunned Alabama to win Sugar Bowl and advance to the national title game. Elliott's fourth-quarter, 85-yard touchdown run and Tyvis Powell's interception on Blake Sims' Hail Mary helped seal the upset.